When my mom was diagnosed with MS the only two public figures who has come out about the disease at that time were Richard Pryor and Annette Funicello. My mom identified more closely with Annette on a personal level. Being same age, gender, and having that wholesome fifties thing going on. She felt some comfort in the fact that someone like Annette had the same dreaded disease she had. Thank you so much for your interest in being a part of Orange is the new pink – raising awareness for Multiple Sclerosis. In 2011 & 2012 we put out a compilation of stories by people with MS about their journey with the disease. Volume 1 came out on paperback and an ebook. Due to cost Volume 2 only came out in ebook form. We are excited to announce that Volume 1 will be available on audio at the beginning of December!!!!! We are now ready to start compilation for volume 3!!!! Due our March 2013! The premise of the book will be the same. The book is meant to educate, inform, and inspire. If you feel you have a great story to share see below for what I need for you. Submissions should be emailed to [email protected] by Feb. 28th, 2013. The MS Project is a collection of things created to raise awareness for Multiple Sclerosis. Consisting of a book, a website, apparel, and an iPhone app these elements work together to bring more attention to the disease, teach people, and create a strong community. The book – Volume 1 was released in March, 2011 and Volume 2 was released March 2012. The books are a collection of stories written by people afflicted by Multiple Sclerosis, or who have loved ones afflicted. This book is meant to be informational regarding the disease as experienced by real people and to showcase the amazing strength people find when facing adversity. The iPhone app – is a tool to create awareness for Multiple Sclerosis. Connected to The MS Project website the app will include a feed from the blog to provide access to the MS community and a wealth of knowledge. The website – is a social networking site where people passionate about raising awareness for the disease can become members and get to know one another. The goal is to create a community to provide support, awareness, and motivation to people within and outside the community. You can currently access the website at http://www.themsproject.com. The MS Project, the book, Volumes 1 & 2, are now available for – purchase on Amazon. Volume 1 Volume 2. Another great blog I came across. Read here. This article is about a personal experience of a child with Autism who wanted to make friends. But all she found in return to her overtures to be friendly was to be bullied back. Her concerned mom pulled her out of the school, quit her job and home schooled her for two years. Then concerned about her daughters socialization needs placed in a school for kids with autism. And it’s been a successful fit. Her daughter is happy and making friends. I came across this amazing post. Please read full post here. Although I am a relatively smart person, I can admit to having done some pretty dumb things in my life. A lot of the dumbest things came after finding out I had MS. I thought if I listed the top five, it might save someone from repeating my blunders. MISTAKE # 1: Not immediately making long-term financial plans. I was eight weeks into a brand-new job in 2005 when I was hospitalized with transverse myelitis, which was followed by a diagnosis of MS. I should have looked into disability right away, even if I wasn’t ready. I should have learned everything I could have about it. Instead, I went back to work way too soon and focused on keeping my job instead of maintaining my health. Despite worsening symptoms that were seriously compromising my mobility and function, I kept pursuing a high-stress career that I was both good at and enjoyed. I ignored the handwriting on the wall regarding my own future. After two frantic years of working 12-hour days, being on call 24/7, determined to prove that MS would not impact my performance, my position was eliminated and I was out of work. Before finding a new job had never been a problem. But things were complicated now. I couldn’t “pass” any more. Now I needed assistive devices, a cane or a walker or more frequently, a wheelchair, to get around. Huge red flag for hiring managers, although, of course, there is almost no way to prove that. World MS Day is coming soon on Wednesday May 30th, 2012. If you’re not familiar please go check the site out and see how you can be one of the 1000 faces. I came across this amazing site called Kiss Goodbye to MS. It’s an initiative based out of Australia that works with people to raise money to go towards MS research and services for people with MS. They have some amazing things going on so I encourage you to check them out. Love My MS Life Finding happiness and hope every day while living with multiple sclerosis. I Really Need to Pee! Let’s talk bladders. It’s a big topic on my mind right now because in the last few weeks I’ve been feeling the effects of bladder dysfunction — an MS symptom that’s plagued me since my early 30s. I’ll admit that this isn’t something I love to discuss, but it’s an important issue because so many people with MS deal with it. 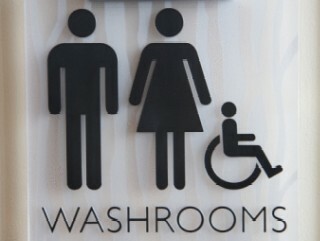 The National MS Society says at least 80 percent of people with multiple sclerosis have bladder dysfunction. It’s invisible and uncomfortable. And unless you experience it, it’s difficult to comprehend the physical and emotional toll it takes on you. Before I get into my personal story, here’s a quick explanation of bladder dysfunction — if you don’t mind some nitty gritty details. When people with a normal, healthy bladder feel like they have to pee, they can hold it until they know that they really gotta go. Then they can hurry to the toilet and…read more.